Callie Heilig is a Certified Nurse Practitioner for Central Care Cancer Center at the Garden City, KS clinic. She has a Bachelor of Science Degree in Interdisciplinary Studies from the University of South Alabama and received her Master of Science degree in Nursing from the University of Alabama at Birmingham. 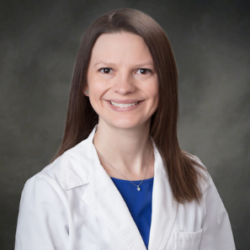 She is an Advanced Practice Nurse with over 5 years nursing experience, which included experience in emergency medicine, primary care, behavioral health, gastroenterology, and medical surgical nursing. She is a member of the American Academy of Nurse Practitioners and Sigma Theta Tau International Honor Society.